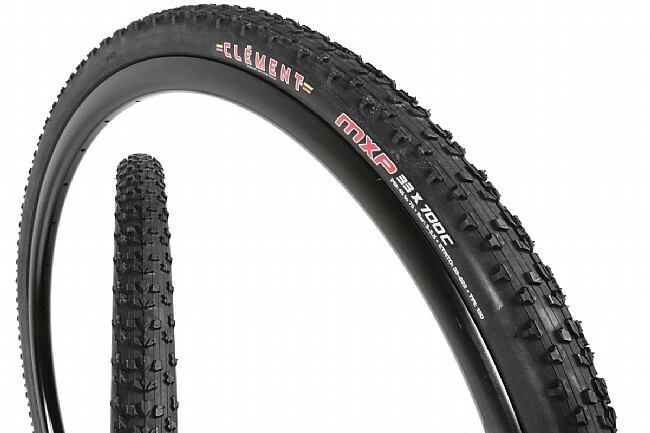 Clément has expanded their 'cross line with the versatile MXP Clincher. Taking its name from the Milan Malpensa airport code, the MXP is designed for intermediate conditions, making it perfect option for varied courses where both wet and dry conditions are on the menu. The unique tread is based on the classic Grifo tire, a favorite of racers everywhere. The MXP uses split center chevrons which allow it roll quickly in dry conditions and bite down in light mud. Cleat-inspired side lugs provide additional grip in the corners, and the open spaces between the center tread and shoulder areas allow the tire to shed mud and debris. Available in standard clincher and tubeless-ready models. The MXP Clincher uses a supple 120 TPI casing. 68 max. recommended PSI. 700c x 33mm (UCI legal; 33-622 ISO). 374g. I have not yet found a better all around tire, good in mud, sand, yet still rolls fast. Mounted tubeless, held air right off the bat. These are great tubeless tires for CX racing. They've taken me to the podium of every CX race I've entered this year. Great for courses with a mix of surfaces. I may ride these tires full time. Ive had the PDX tires on my bikes full time. I know they are mud tires but I like them. After putting theses tires on they are staying on. They worked great! I love how this tire handles and rolls in the mud. It's my go to in the muddy wet part of the year. Switched to these from another brand. What a difference in grip under all conditions. Bought the tubeless ready MXP 33mm tires. I've raced them on dry grass, wet grass, sand, and in mud and have been very happy with them. Only slipped once on a hairpin very muddy turn. I have ridden them at 25-30 psi on several cx courses with no burping issues. At 40-45psi for gravelpavement long rides and love how they roll - can't feel any resistance on them. Only have a couple hundred miles logged on them so far but no sign of wear at this early stage. Seem to be my answer for all around cx racing tire. Would buy them again for sure. I was using some Panaracer Cinder x's before these, and they were good tires, same weight, 2mm wider with bigger knobs. These blow those away. These Roll faster, have better high speed cornering traction, shed mud better, and have a smoother ride. I have tried them in every condition, dry, wet, mud, big chunky gravel, fine hard pack gravel, ice. I can't believe how great they are and they have good standing traction as well. Love the traction. Unreal actually when compared to others I had ridden. Maybe it was just fit my riding style. But I did win my first race on them! I had a couple issues with mounting. The rear tire took a bit to finally hold air but it has held ever since. The first front tire I got was not glued properly from the factory and had a wobble but it did hold air with no issues. The third tire (replacement for the front) is also having a hard time holding air. I am on Stans rims, two rim strips plus the rubber strip to take up more space. The fact that the original wobbly front held with no issue and now this one won't makes me suspect of the tire. I have spoken to others with the same issue. Great price on a great all purpose tire. I use this tire for all types of riding, it's great in wet and muddy conditions as well as dry hard pack. I don't race a anymore but if I did I would use these! No real rain yet this season, but what mud these tires have encountered has been fine. They feel pretty solid on grasspacked dirt, though a little squirrely on gravel. I've been training on these this summer and experiencing minimal wear and they ride great. I run pretty low pressure for my 205-pounds and they soak up the bumps with no pinch flats yet. Very good traction on grass, Carolina red clay, and shallow mud. I've ridden most of the clinchers on the market and the Clements have been the best by far. This is my first year using Clement MXP tubulars. I have already had 3 podiums and 3 wins. These wins have been due to the excellent Corning and very little rolling resistance in the straight away. Great tires!! Bought these to try this cx season and so far it's the best all around tire I've ridden so far, awesome grip in dry and damp conditions, cleans out well, tracks straight in the sand and rolling resistance is fair for those gravel rides. If your looking for that one tire to serve all purposes, I feel this one is it! I've used this tire in some very sloppy conditions with thick and soupy mudd and it has preformed flawlessly. Fast ride, I'll usually run the mxp in the rear and a pdx up front but because if the grip and faster speeds with this tire I'm gonna run it up front as well. Ran the tubless version on non tubeless rims (not recommended) and never had a single issue with burping or even loosing air. I'm 170ish pounds and ran 28.5psi. Nice tire for any condition. These have transformed my ride! Great compromise for most cross race conditions. Use Orange sealant when running tubeless. I have been running this tire tubeless for a couple of months now without trouble. It does lose air over night but it does just fine during a race or practice session.